Quiet family oriented neighborhood and wide sandy beach. 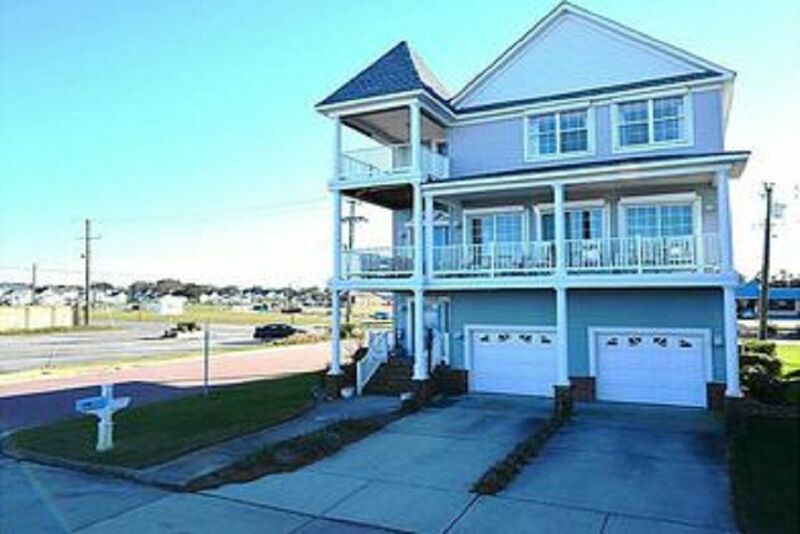 Ocean front 3 story home, 3,402 sq ft, with amazing views on all levels. 4 Bedrooms with 2 Master suites, 3 1/2 bathrooms (Jetted garden tub in master). Gourmet kitchen with open concept to a spacious living room. Reading nook, Full length rocking chair porch to watch the sunrise. WiFi, Flat screen TV's all bedrooms and family room with cable, ping pong table, games, beach toys, gas grill and everything you need for a fabulous relaxing vacation! Minimum of 3 nights stay please. This house was all that it claimed to be. It was spacious, bright and had fantastic views. The kitchen was modern and open and gave us plenty of room to work and entertain. The openness of the first floor, (kitchen, dinning and living room) made it a great place for our family to hang out. We were there with my adult children and their families and there was plenty of room for everyone. I especially liked the addition of eye hooks at the top of the doors since my 3 year old grandson was with us and is quite adept at opening doors. The beach was only 100 feet away and everyone took advantage of it. The bedrooms were are all comfortable and the 3 and half bathrooms left lots of room for everyone to get ready when we had to go out. I would definitely try to stay here on future visits to the area and would recommend it to friends and family. Beautiful home with amazing bay views. Fran, thanks for taking care of my place and glad you and your family had a great time. Great views overlooking quiet beach. Our group of 3 couples with 4 young kids (ages 2 to 8 years) had a fantastic long weekend at this spacious beach home with lots of great living space, bedrooms, and amazing views from the balconies of the ocean. You are just steps from the ocean, right on the beach walkway, which we didn't appreciate until we got there and were very happily surprised! The open concept kitchen and living room is perfect for big group dining and playing. The beach has soft sand, not too crowded (we were there in late August), and rock breakers to allow a quieter surf for the kids. We're already planning our next vacation and hope it is available. Thank you, Eric, for being a great host, giving us all the information we needed, and being quick to answer any questions we had! Spent 6 days at this wonderful home and it was everything we had hoped for and more. Gorgeous views from the porch, within walking distance to the beach, fantastic kitchen and great room. Highly recommend this home. Great renters! Happy to rent to them anytime. Completely prepared the house for a quick turn.